I am going to talk some more about ricotta. I can’t help it. Remember in "Annie Hall" when Woody Allen tells Diane Keaton, “Love is too weak a word for what I feel -- I lurve you, you know, I loave you, I loff you?” (No? What’s wrong with you? Are you that young? Just put it in your queue, okay?) Anyway, that is how I feel about ricotta. This week’s recipe, Lemon Ricotta Spaghetti with Arugula, was brought to you by Food52’s Francesca Gilberti, she of the lovely thick hair and Harvard thesis about Elizabeth David, because I was so wiped out from weeks of long work hours I could not even think about picking a recipe. This one caught her fancy, and I was happy it did, because it was right up my alley. Step one was making homemade ricotta, thanks to MrsWheelbarrow, who showed me how incredibly easy this is (here is a gold standard recipe by Jennifer Perillo, for whom my heart breaks with the rest of the food community this morning over the loss of her dear husband). Added bonus: you get the whey that melissav calls for here. I very much appreciated that she walked me through each step, even telling me when to wash the arugula, i.e. when the pasta water is boiling. Because I used capellini (more on that in a minute), which I knew would cook more quickly than spaghetti, and because I am a dirty recipe cheat, I added the lemon zest to my garlic a little while after I got it cooking. Then, when the water was boiling, I added the ricotta, which I had to break up a bit with my wooden spoon. Later, the pasta went in as instructed, with the whey and the arugula. Boy did those leaves cook down quickly! In fact, I’d like to say a thing or two to you, miss fancy pants aromatic salad green: You cost a lot, even in the farmer’s market. A whole lot of you reduces to very little; you are hard to divine. In short, you’re the friend who spends the entirety of every lunch date telling me about your stupid boyfriend, and never picks up the check. My only complaint about this very lovely recipe is that I would like more ricotta-and-greens to pasta ratio. In part, this is because I am greedy. And no doubt, as my husband helpfully pointed out, the capellini was really too dense for this recipe. Next time, when my larder is full, I will make it with the pasta called for here. And add more cheese. And more arugula. And some fresh black pepper. Jenny’s appetite knows no bounds. 1/2 pound spaghetti [I use whole wheat but use whatever you prefer] Ask a question about this ingredient. 1/4 cup extra virgin olive oil Ask a question about this ingredient. 2 cloves garlic, sliced lengthwise as thinly as possible Ask a question about this ingredient. 2 tablespoons lemon zest, from 1-2 lemons Ask a question about this ingredient. juice from 1 lemon Ask a question about this ingredient. 1 pinch red pepper flakes Ask a question about this ingredient. 1 cup fresh ricotta, homemade or best quality Ask a question about this ingredient. 4-6 tablespoons leftover ricotta whey or leftover pasta boiling water Ask a question about this ingredient. 4 cups lightly packed arugua Ask a question about this ingredient. salt Ask a question about this ingredient. Bring a pot of well salted water to boil Ask a question about this step. While the water is coming to a boil, slice the garlic and put a small saute over low heat. Add the olive oil, the garlic, and a nice pinch of salt. Let the oil and garlic slowly heat up. You don't want the garlic to brown. You are just warming the oil and letting garlic infuse it. Ask a question about this step. While the oil and garlic are doing their thing, zest the lemon and wash and dry the arugula. Ask a question about this step. Once the water comes to a boil, add the pasta and cook until al dente. Drain and reserve some pasta water if you don't have any ricotta whey. Ask a question about this step. Once the pasta is boiling, turn the heat under the saute pan to as low as it goes and add the ricotta, lemon zest, and a pinch of red pepper flakes. You just want it all to warm it up while the pasta is cooking. Ask a question about this step. Once you drain the pasta, add it to the saute pan and toss well. Add 1/4 cup of whey or cooking water and the arugula and toss again to coat and wilt the arugula. If you feel it is too dry, add up to 2 more TB of whey or cooking water. Taste for salt and add the juice from 1/2 a lemon and toss once more. Ask a question about this step. Serve, topping each bowl with a few sprinkles of coarse salt or fleur de sel and a few drops of lemon juice. Ask a question about this step. By day, Jennifer Steinhauer, aka Jenny, covers Congress for The New York Times. By night, she is an obsessive cook. I love swiss chard in my pasta--saute with a little garlic and olive oil (and a sprinkling of salt and pepper, then add your pasta, cheese, and a bit of cooking water. 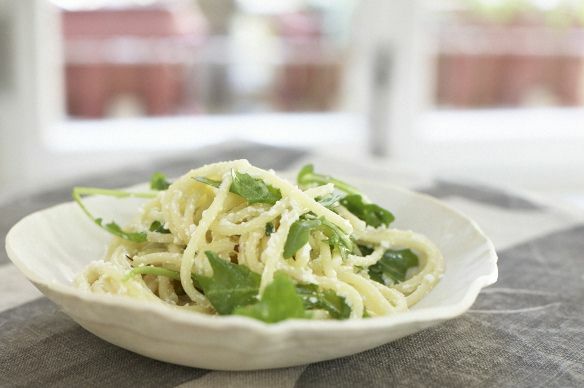 Not as peppery as arugula but if you use pecorino romano in addition to your parm you will achieve a lovely bite. Can't stop thinking about Jennifer and her girls. As a non-NYer, I feel relieved that Jennifer has a group of NY Food52ers to show her the support and love she most certainly needs. Jenny, thanks for highlighting Jennifer's wonderful ricotta and melissav's delicious-looking spaghetti here. I'll be trying the pasta later this week for dinner. I was about to suggest escarole but I see boulangere has already done so. It's a sturdier green than arugula but unfortunately lacks that peppery spark. Still, as far as volume, I think it's a good choice, combines well ricotta, plays well with other kids. You may want to test it out with a sturdy pasta shape like bucattini or perciatelli. Jenny - Thanks for highlighting my recipe. Glad you enjoyed it. Although it is not quite clear in the instructions, I toss the argula in at the last minute for just a quick toss so they don't wilt as much. That should help a little with the shrinkage. PS - this post was very timely as just last night, I made a batch of Jennifer's ricotta for a pasta with heirloom tomatoes. My heart goes to Jennifer Perillo and her daughters. I will keep them in my thoughts and prayers. yes looking at the photo i now realize that. next time i will do just that. I make a similar pasta dish, and I never cook the arugula separately -- the heat from the pasta cooks it just enough when I toss everything together in the bowl. Sometimes I bulk up the greens portion of the program with spinach. I would say don't cook the arugula at all -- just toss with the hot pasta at the last minute unless the greens are very large/tough, which arugula almost never is. Another idea for bulking up the greens portion of the program (while keeping it cheapish!) would be to use arugula for bite along with spinach. I still wouldn't cook the greens unless they were very mature though. I'm so sorry for Jennifer and her family. Her last post, "last dance" was so poignant, I just cried. ((hugs)) and prayers to them. It's not "just" a virtual community when you feel their loss. My heart goes out to JenniferPerillo. Thinking so much of her and her family. No words can express the sorrow Jennifer must be feeling. My heart breaks for you and your family. ...feeling sadness for you, Jenny, and your family. Sorry, I meant Jennie (not Jenny). my thoughts & prayers to Jennifer & her family through this terrible tragedy.. This sounds like a great and easy recipe and I love that you wove in Jennifer Perillo's brilliant ricotta cheese. I hope that she is finding support in her family and friends and the many warm and caring thoughts form the food community. So, so hard. What a sad day--Jennifer's news is almost too much to bear. Our hearts go out to her, and your column is a nice way to honor her at such a sad time. melissav has great pasta recipes using fresh ricotta--I tested this as an editors' pick last year: http://www.food52.com/recipes/5413_lemon_ricotta_pasta_with_garlic_and_zucchini--it uses zucchini! Which we all have tons of right now--right? Really great. I just made this pasta with the zucchini 2 weeks ago! Loved it! It had a surprising kick that really made the dish special. No leftovers, of course. Spinach could also work and it's great with lemon and garlic too! Would have to watch when you add to the past though so it doesn't wilt to mush. I'm gonna try with baby rocket (as we Brits call it) first off though, as I can't eat enough of the stuff, Lovely recipe. Spinach could also work? Great with garlic and lemon too! I love rocket (as we brits call it) so I'll be using that first off. Lovely recipe. Annie Hall, lol. Sad news about Jennifer Perillo. Jenny, I've come to depend on you to brighten my Mondays, and (no pressure) you always do. Jennifer Perillo's ricotta method is a slam-dunk. Thank you for letting us know so gently about her husband. thank you so much. this is a beautiful community and i know they will rally around her at this incredibly painful time. I don't tell this story often, but I lost my husband when my son and daughter were young also. It felt like an amputation. Words truly cannot describe the feeling. We all ache for her. Ache. I am so glad she has the local food52 community literally folding in around her. Ah, Jenny. As always, I can count on you to pull me out of my Monday mood and remind me of the reasons I like and dislike arugula with a smile. My heart and thoughts go out to Jennifer Perillo and her girls. I'm still trying to love arugula, as current trends tell me I must. But I'm failing. Life is short, and I really do love the more bitter greens. Sigh.